Kate and Michael were married at Palm House, Sefton Park. Kate had a white rose and blue hydrangea shower bouquet for her bridal bouquet, complimented with all blue hydrangea bridesmaid posy bouquets. 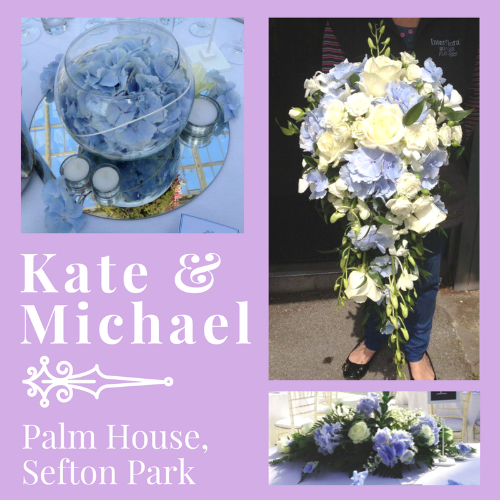 At the wedding venue, St Matthew St James Church, Rose Lane, Liverpool, Kate had white rose and blue hydrangea pedestal arrangements and blue hydrangea ball pew ends. At the reception at Palm House, Sefton Park, they had a matching top table arrangement, alongside blue hydrangea fishbowls for the table centrepieces. To see all of Kate and Michael's flowers, please visit their wedding gallery here.